That would be spinach and broccoli pizza. And it is one of my favorite dinners. We have homemade pizza a few times a month, and I'm always on the lookout for fun variations. Sure, we like the standard cheese and pepperoni, but y'all know that I like to mix things up as well. This pizza certainly does just that. 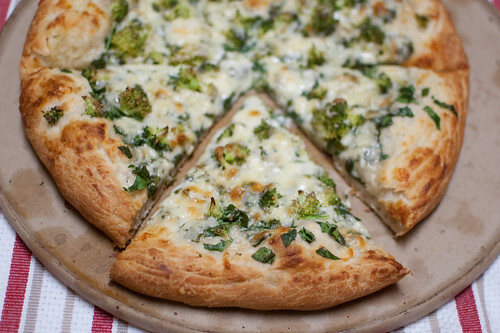 It is normal pizza dough with a Parmesan cream sauce, and topped with spinach, broccoli, cheddar, and mozzarella. It may sound like a strange combination, but it works. 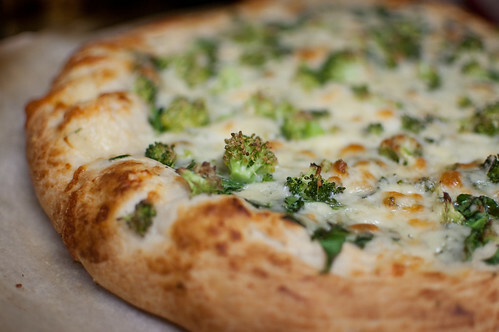 Roasted broccoli is one of my favorite vegetable side dishes, so to combine it with pizza is sure to be a winner! It's not often that we repeat meals, but I have made this pizza at least 3 times. One of those times, I cut it into rectangles and served it as an appetizer, and it was enjoyed by all. This makes more white sauce that you'll need for the pizza, but the rest is excellent for dipping the pizza and crust! Even though I wouldn't classify this pizza as "healthy," it is a nice vehicle for some veggies. Once you have your crust ready (whether you buy or make it is up to you), it comes together quite quickly. And Joey's favorite aspect of this meal: very few dishes! One pot, a cutting board, knife, and cheese grater. That's it. All in all, it is a fast, easy, and delicious dinner. And one that I will most definitely continue to make regularly. If you love pizza, check out my Featured Recipes Page - I've updated it with lots of great ideas for pizza and pasta! Preheat the oven to 500 degrees for at least 30 minutes, with pizza stone. To make the white sauce, melt the butter in a small saucepan over medium heat. Add the flour, and cook, whisking constantly, until golden and bubbly, about 1 minute. Whisk in the milk, and add the garlic cloves. Cook, stirring often, until the mixture thickens and bubbles. Remove from heat, season with salt and pepper, and stir in the parmesan cheese. Discard the garlic. Roll out the pizza dough into a 12-14 inch round. Brush the perimeter with olive oil. Spread a thin layer of the white sauce over the surface, then top with the spinach and broccoli. Scatter the cheeses over the vegetables. Transfer the pizza to the stone, and bake 10-12 minutes, or until the cheese is melted and bubbly. Allow to cool slightly before serving. I love sneaking veggies in places you wouldn't expect! LIKE PIZZA! This pizza looks amazingly delicious. This pizza looks awesome! The crust looks delicious too! So glad you enjoyed this. I have got to make it again soon. Maybe next week! Total yumminess. We love making "personal" sized pizzas so we can top them any way we like. Add some pineapple to this and it's similar to one of our faves.